It would be a disservice not to take some time to address the impact of the Law of Attraction on the level of Home Based Business Success one can achieve. Regardless of how you conceptualize the workings of this law, whether merely as a psychological process or spiritual one, it would be wise to give it some attention. Have you ever landed on a website just to be assaulted by ads, pop-ups and flashing buttons desperately trying to get you to click on something to capture a dollar? What was your reaction? Have you ever opened an article just to find out that the title was deceptive and it was really just one big sales pitch for whatever the author was trying to desperately pitch? Did you decide to join their opportunity? Could this be the Law of Attraction at work? As Network Marketers we are extremely focused on success… You have to have respect for anyone in this industry as it shows that they are part of the few people actually working to achieve their dreams. So many in our society don’t even try. However… You have to ask yourself whether your communications are sending the right message. Do they really communicate success or desperation? The Law of attraction is a way of saying “like attracts like” or “what you put out you will see in return.” For example, someone always looking for a fight will usually find one! Additionally the Law indicates that every subject is really two subjects. This is important to our discussion of MLM Success because many who are looking for success are really desperately trying not to fail. There is a huge difference in the “energy” of these two subjects. Success & Failure are intertwined really being two sides of the same coin. So many in this industry are struggling, frustrated, desperate, tired and discouraged and yet they continue to fight, they continue to push …and they still see no success. You really do have to admire the effort but there is an easier way. Instead of fighting to paddle upstream to the land of failure wouldn’t it be nice to let the current take you downstream to the land of success! That is where you are trying to get to is it not? How do you know what you are attracting? Simply ask yourself how you feel in this very moment. Do you feel abundantly successful? Which brings us to HOPE. Many do sit down in front of their computers feeling hopeful that their efforts will see results but hope is also an uncertain and future vibration. SUCCESS is a confident and present tense feeling. 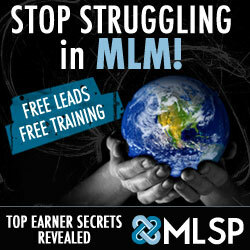 Unless you first feel successful you will never be able to create the MLM success you are looking for. Hope attracts hope. Success attracts success. Whether we are discussing an immutable law of the Universe or a self fulfilling prophesy is a mute point. The evidence is clear… ask yourself how you feel and then ask yourself if the results you have seen match. Do you want to change your results? Then you absolutely must first change the way you feel.There is no other way around it. You cannot create success feeling frustration or any of the other negative emotions. MLM Success is about, what you think, how you feel, what you believe, who you are and finally what you do. Everyone starts with action, yes action is necessary but only after you have addressed your internal reality will you see positive results from your efforts. There is absolutely nothing outside yourself holding you back from the MLM success you are looking for.The Universe is abundant, opportunity abounds in every direction. This is a multi-billion dollar industry. I know what you’re thinking but…the current economic situation is only an indication of mass consciousness…you do not need to accept a poverty mindset just because everyone else has. For example…Amway Global signs up twelve thousand new distributors a day! With a 95% failure rate imagine the number of people out there from this one prospect pool that are in need of your help! BECOME an MLM Leader by virtue of who you are and the success will manifest. The opportunity is there! All the success you are looking for is right there. ← Video Email…What’s the Best Video Email Software? Wishing you much SUCCESS in 2012! Come back often!! Thanks Travon! I’m glad you enjoyed it. Be on the lookout for our Project 50,000 announcement. We’re giving away 50,000 books in 2012!! There’s a teriirfc amount of knowledge in this article! Interesting…I haven’t had anyone else say anything. Could you check again? Thank you! If you need any help achieving your dreams and goals in 2012 send me a message. Happy Holidays! Yes it’s Word Press Theme…message me and let’s discuss.